An Ostrich Egg is the largest edible egg in existence today and is equivalent in volume to approximately two dozen chicken eggs. 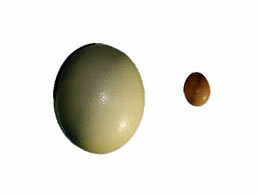 An Ostrich Egg can weigh between 1.2kg and 2.2kg and its length is between 12cm and 15cm. To make omelette or scrambled eggs for all the family, simply drill one hole in the shell and shake the contents out. The shell can then be washed out, decorated and put on display. To boil an Ostrich Egg give yourself plenty of time as it takes about 1 hour and a french stick makes a great soldier! Fresh Eggs are available April - September, either ex farm , online or collected from your nearest Farmers Market.